After the departure of Peter Thomas and Graham Hllton, Chris, John and I took a break for a while until we could find a new drummer and maybe guitarist. Along came Martin Bailey a young drummer who was keen to get involved. I had met another guy called Graham Seal, he played keyboard, not brilliantly but it did bring a new sound to the band. So Chris and I starting in his house in Coronation Street had done a full circle, still together, now starting band three, The System. 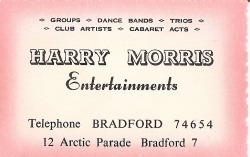 We remained with Harry Morris Entertainments and picked up on doing the same venues as The Yolks did. Having lost Peter Thomas we also had to find a new practise room which we did in the centre of Elland above some shops by the Wellington pub. The band was short lived due to the fact that Martin wanted to go to University, Graham wanted to do a Summer season at Butlins or at least go fully proffesional as maybe a compare. John was having regular problems with sore throats. cannot recall exactly when but we just folded up. I had started a job at Tinkers photographers of Elland and was happy to take a rest and have some evenings free. Graham did just what he said he wanted to do, he became a compare at the famous Batley Variety Club and the Feista Club in Sheffield, We kept very close Graham and I, it gave me the chance to travel with him to and from Batley and Sheffield. I was allowed to freely wonder around backstage and mingle with some great stars and heros of the day, including Neil Sedaka, The Drifters, Olivia Newton John, Roy Orbison, Tommy Cooper. I also kept in contact with John Bell who married Carol. Sadly John died in 1982 leaving his two children, Julie aged 12 and Jason aged 5.